Heat the oven (with the oven rack in the middle) to 425°F. If you plan on making brown rice, start it now. Season the chicken with ¾ teaspoon of the salt and the pepper. 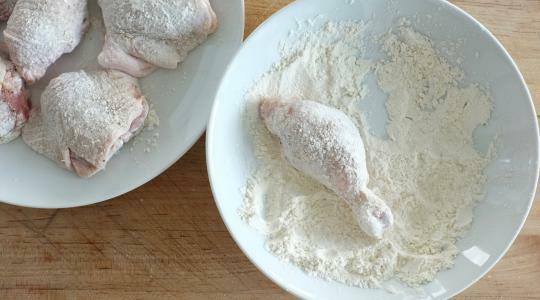 Dredge the chicken in the flour and shake off excess so it’s lightly coated. 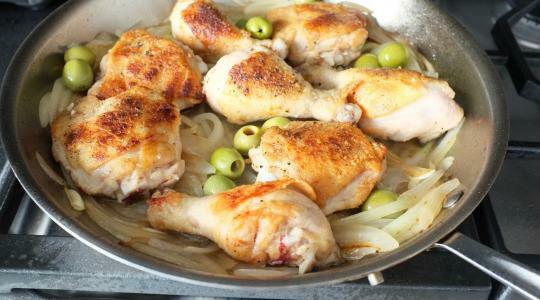 In a large ovenproof skillet, heat the oil over medium-high heat. Add the chicken, skin side down, and cook 3 to 5 minutes, until the skin is dark golden brown. Flip the chicken and cook 3 to 4 minutes more, until the undersides are golden brown. 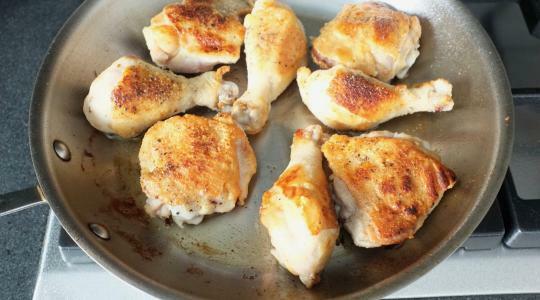 You’ll have to turn the drumsticks a few more times to get them golden brown all around. Transfer the chicken to a plate. While the chicken cooks, slice the onion and thinly slice the garlic. 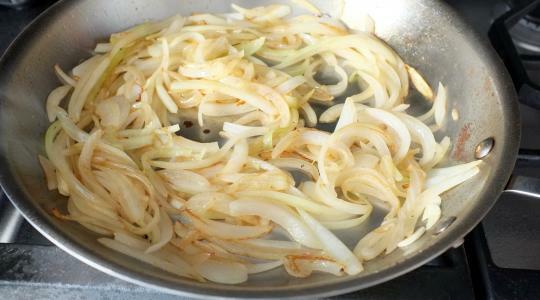 Add the onion and remaining ⅛ teaspoon salt to the skillet and cook, stirring often, for about 5 minutes, or until the onion softens. Add the garlic and cook, stirring, for 1 minute more. Add the wine, olives, and 3 tablespoons of water. 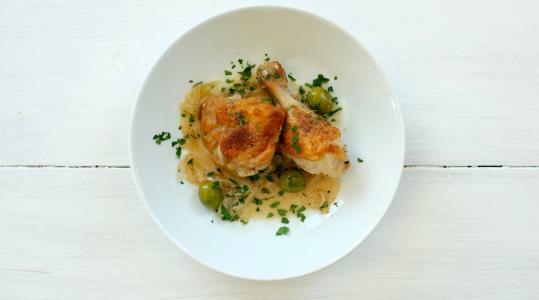 Nestle the chicken in the onions and transfer the skillet to the oven and roast for about 25 minutes, until cooked through. Serve the chicken and onion over brown rice, if desired, and sprinkle with parsley.